Happy 2013 everyone! Hope your new year has started off on the right foot today. Lately, I have been seeing all of these really neat infographics. I asked myself, why not just make my own cool infographic? So, that is exactly what I did! 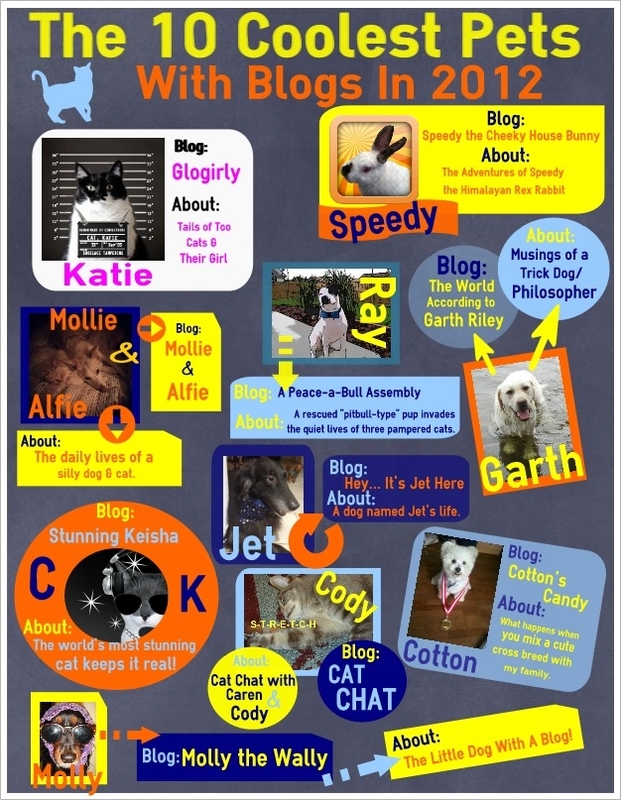 I have created an infographic with the 10 coolest pets with blogs in 2012. The infographic looks a little busy to me, but there were so many cool pets that I wanted to include. Unfortunately, I couldn't include everyone that I wanted to. All of these pets have something special - attitude, heart, cuteness, humor... the list goes on and on! Here are 10 cool pets that blog! I'd love to know what you think of my creation! If you'd like to share this infographic, please be my guest as long as you give credit back to me. Below is a list of links to all of the blogs listed... what are you waiting for? Go check out these super cool pets! Oh man, I don't know half of these blogs...must check them out soon!! :-D Awesome infographic!!! Happy Happy New Year's Ann and Family!! Happy New Year's Goose! Hope you enjoy some new blogs! Glad you like it Speedy, you are one cool bunny! Great list of blogs there! Thanks Gizmo! Maybe I will create some different ones in the future! Looking forward to checking out the blogs that are new to me. What a great idea! I'm sure you will love them! Happy New Year guys! I love starting the year off with some new blog friends to discover. Yay! WOW!!! Are we ever FLATTERED to have made your list!! THANK YOU!!!! We never expected to be here! What a cool idea!! HAPPY HAPPY NEW YEAR! Love, Cody and "Mom"
You guys are way cool! Happy New Year to you as well! OMC!!! This is SO COOL!!! We are honored to have made your list of top picks!!! This is so sweet..thank you!!! We'll definitely have to share! Katie is super cool! Glad you enjoyed it. Hope you guys have a wonderful 2013! I love your infographic! And hurray for A Peace-a-Bull Assembly! We love them! I haven't checked out any of the other blogs you mention, so thanks for sharing them! Ray is so awesome! And thanks for the feedback. Happy New Year to you Athena! LOVE your infographic! And not just because you listed ME! Thank you SO much - I'm deeply honored to have been included in your list! What a great way to start 2013!!! Thanks Garthy-poo! You definitely deserve to be on the list. Happy 2013! Ooo a few we don't know! We'll have to check them out! Happy New Year Rumblepurr and Hammy! I know that you will love all of the blogs! Thanks for stopping by! Happy New Year and thanks for the chance to make some new pals. Glad you liked it guys! Thanks for stopping by - you won't be disappointed! Great job - you worked hard on that poster, we can tell. Nice work! Will have to look up the one's I'm not familiar with. Those are some good choices for the 10 best blogs. And the graphic is great. Good job. Take care. Whoa! I'm honored and humbled to be in a list with such wonderful blogs! I must say I deserve it though. Thank you and Happy New Year. Yep, you definitely do deserve it CK! How did we miss this? We are so chuffed. Thank you so much for including us. We are really touched. Happy New Year to you all. You have made our day. We will put it on our blog today with a link back to you. Have a terrific Thursday. Glad you like it Molly! You are totally cool with all your fancy outfits you dress up in! Mollie is my girlfurfriend. I just lovz a silly, smart blonde. You have a super cool girlfriend Mr. Ranger! Those are some great ones, and some new ones I'll have to check out. I also love Frankie and Ernie, Benny and Lilly and Pip. They always make me smile. I love the infographic it looks cool. An excellent choice of blogs. We're so happy to see so many friends got your nice award. Concatulations to all! Thank you so much for putting this together. I love checking out other pet blogs I haven't seen before. I've already been through the great list. Happy 2013! I just saw this and OMD I is so very honored to be part of this!! You is pawesome! I posts bouts this soon!